Extensions are a powerful component of Cosmic JS that allow you to create custom views in your Bucket Dashboard. We've recently made some updates to make using this feature even better. You can now edit your Extension information such as Title, Sidenav icon, as well as add query parameters. Extensions are a great way to leverage powerful third party API services in your Cosmic JS Bucket. When you do connect to these services, however, you usually need some sort of API keys to access this content. Until now, adding these keys to your Bucket was usually done in a makeshift way of adding a new Object Type such as "Analytics" and adding an Object to store your keys. This was an ok temporary solution, but definitely needed to change. 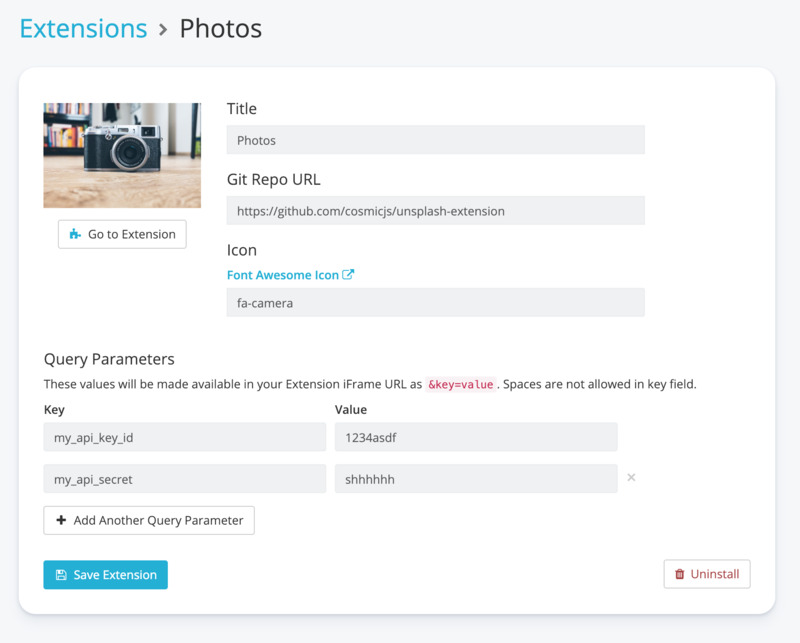 You can now add query parameters directly to your Extension in the Extension edit view which will be added to the Extension iframe query string. If you need an easy place to get started building your own Extensions, we now have an Extension Starter available for download. If you would like more information on what you can build with Extensions, check out the documentation page. I hope you enjoy these updates to Cosmic JS Extensions to help you build amazing custom experiences in your Bucket Dashboard. I'm looking forward to seeing what you build! If you have any questions, feel free to reach out to us on Twitter and in our Slack community channel. Photo by Fausto García on Unsplash. In this tutorial I'm going to show you how to create a "Emoji" app using a little bit of Node, and Cosmic JS. For the sake of understanding how to consume Restful API’s, this tutorial will show how to make simple AJAX requests to the Cosmic JS API in order to retrieve, update, and delete data in our Cosmic JS buckets. Let's get started. Medium has become the de-facto platform for publishing online content. In this article, I'm going to show you how to build a Medium backup application using Node.js and Cosmic JS. Cosmic JS is on a mission to bring API-first content management to the world. Along with providing an intuitive API and content editing experience, our goal is to provide excellent examples of how you can quickly get started building the future of the web using Cosmic JS. We're excited to announce that the Cosmic JS Community has exceeded 3 Million API Requests. In this article I’m going to show you how to get the best of both worlds: A website that is both dynamic, has content powered by the Cosmic JS API that is also a static website. Our static website will be easily managed by a content editor using the Cosmic JS CMS and the developer will also be able to use Markdown files.